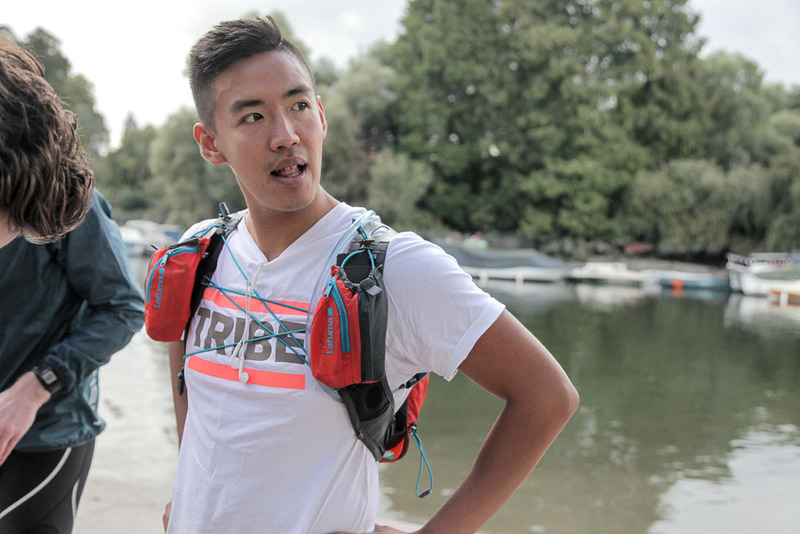 I’m an Indonesian-born, Australian-citizen, Vancouver-domiciled London-based runner. Having been nicknamed as Fat Albert growing up and for most of my early adult years, running or any sport for that matter was never a big part of my life. I experimented with running to escape the stress of going through a divorce as a 25-year-old. Five years later, it’s still the only sport that takes me to my happy place. I run to clear my mind, yet I also run when I need make major life decisions. They say that every cloud has a silver lining and I’m forever grateful that a particularly tough life episode has led me to be the runner that I am today. I turn 30 during Run For Love and I’ve always said to myself that I wanted to do something big, something epic to celebrate making it this far in life! Running has given so much to me and this is a way for me to give something back through the sport. When I started running I was unconsciously running away from something, and so this is now part of my journey to run towards something, and in this particular case, for something. I also want to know how far I can go. I’ve gradually progressed from marathons to ultras over the last couple of years and I love the mental rollercoaster, the adrenaline in my veins, and how it feels when I go through the pain. Myself. I like to think that I’ve done enough training, gone through enough things in life and know my body well enough to pull myself together and overcome any physical and mental obstacle. But what if I falter and for some reason can’t push on? I think I may be my own worst enemy on the route. Alexander Supertramp (aka Chris McCandless) who famously went into the Alaskan Wilderness to find enlightenment noted how important it is in life ‘to measure yourself at least once…’ and that ‘the joy of life comes from our encounters with new experiences, and there is no greater joy than to have an endlessly changing horizon, for each day to have a new and different sun’ This is why I run, why I do these types of adventures. For me, to even begin to understand the meaning of life and appreciate its incredible beauty I need to put myself in a place where I feel small, foreign and away from people and things that give me comfort. And hopefully, I will come out of it stronger, wiser and more appreciative of the world. I don’t consider myself as your typical runner. I don’t really have a runner’s body or prescribe to specific training plan – I like to keep methodical training to a minimum as I prefer to train based on my feelings - that is how I feel and/or what I desire to achieve that particular day – whether it’s to take in a particularly scenic route and ponder about life or test my fitness with a ‘this is going to destroy me’ hill training. I love to run with a crew when I feel particularly social or when I need a bit of a push but I do enjoy running in solitude most of the time. I use a lot of painful episodes in life as a motivation to push through, whether it’s the breakdown of a relationship or a personal ‘failure’ – somehow the pain transforms into that much-needed fuel. But I always think back to my ‘well-fed’ (a.k.a chubby) 8-year-old self. I have just recently migrated to Australia and didn’t know any English, and as a cruel joke (well at least that’s how I explained it to myself) my classmates entered me, the roundest boy in school, in the 800m inter-school carnival race. On the day, all I knew was I was supposed to run but I didn’t know for how long. Just before halfway mark, I face planted first in the middle of the track and had to be carried off with everyone laughing. This is still one of the most embarrassing moments of my life but one that without fail push me to continue running when I’m struggling. Who’s laughing now?! I don’t even want to think about this! The price I pay for the lifestyle I’ve chosen to live over the past 10 years is that I can find myself alone a lot of the times. I’m constantly on the move, traveling and moving from one country to another and running is my constant and trusty companion. It’s my physical and mental release so I will definitely struggle should the day come where I won’t be able to run anymore for whatever reason. I’ll cope of course, but it will be very hard! It’s hard as it is now when I’m injured and I see other people running! I’m not a cyclist and I was very excited to take on the cycling challenge. However due to personal reasons, I could no longer commit to the cycling stage which is a shame, but also maybe the Universe’s way of telling me ‘don’t be a fool Albert! Multi-day cycling through the Alps requires more training and experience than what you can squeeze in before the race’. I hear you universe. Back in high-school, my group of friends and I would excitedly discuss all the things we would be doing in our twenties and what we want to have achieved by 30. A lot of these things involved traveling the world, living in the big cities and venturing out to the remote corners of the earth, as well as making some sort of impact in the community and leaving a legacy. Life has led all of us on to different paths and I’m one of the few who is still striving to do all those things we dreamt of as naïve teenagers. They are super excited for me to do this and I seem to have re-ignite the adventurous spark they all once had – so I’m doing this for them, and for those who either can’t go on adventures for one reason or another or who need that extra little push of encouragement. I’ve been promised that I will get six-pack abs after this adventure – so I can’t wait! But seriously, I’m looking forward to being part of a story that everyone who participates in this expedition will recall and tell their friends and family - a story of adventure, of camaraderie and hopefully a healthy dose of shenanigans that will continue to be told and passed on for many generations to come. And last but not least, I’m going to take this opportunity to emancipate the inner fashionista in me. This will be the debut of The Albert Kurniadi Summer 2017 Running Collection showcase. Six whole days of it, so watch this space.